Keep food looking and tasting like nature intended with this alternative to metal vegetable peelers. The ultra pure material glides through any food without effort thanks to the incredibly sharp edge and non-stick surface. Instead of reacting with acids and other substances to change flavor, alter appearance or give veggies a funny smell, this one just takes the skin off, and leaves everything else unaltered. Your fruits won't brown as quickly, and you won't wonder where that odd metal taste came from. It is equipped with loops on either side to quickly remove imperfections, and the blade will pivot slightly to conform to foods as you work. It has a slip resistant thumb grip at the top, and a comfort grip coating all over to reduce strain and allow for constant use. The Y-Shaped handle makes it equally easy for left and right-handed people to use, and because it's dishwasher safe, maintenance is a breeze. Versatile. Use for fruits or vegetables. 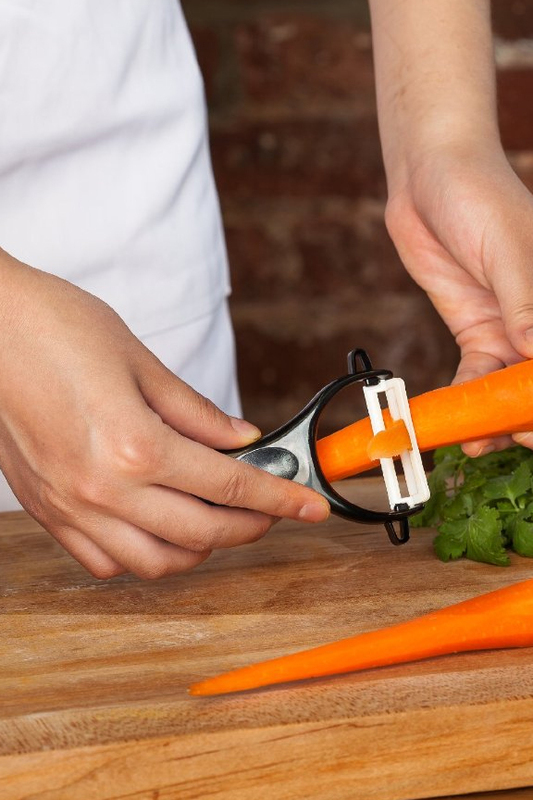 Ideal for food with relatively flat surfaces like carrots and cucumbers, but the pivoting blade easily adapts to all others. Advanced Ceramic. Incredibly sharp and long lasting, the blade lasts much longer than comparable metal ones. Prevents Browning. The pure blade material will not add flavor or odor to your food, and it will help to prevent browning that metal ones cause. Non-Stick. 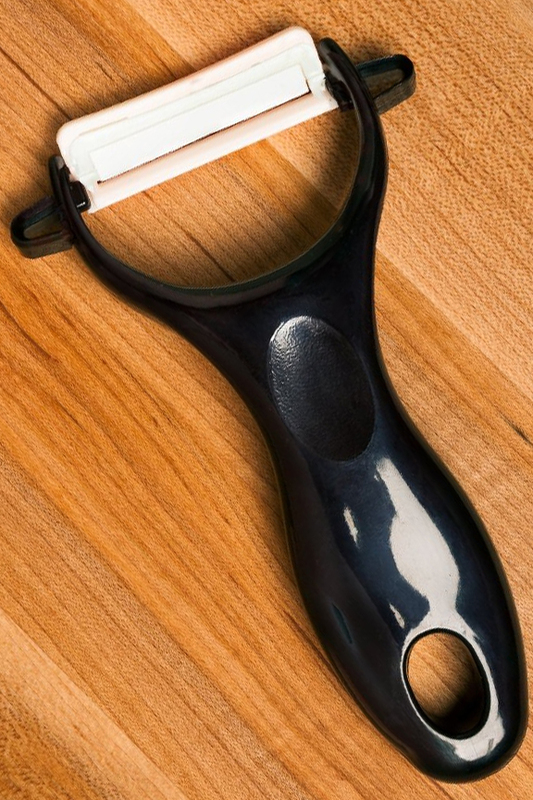 Not only does it make peeling easier, the stick-proof blade also allows for faster and easier clean up. Comfortable. An ergonomic handle combines with slip resistant material and a comfort grip coating to make a tool that is easy to handle. Perfect balance ensures easy usage and zero strain. Precision Engineered. High quality materials and superior construction provide unmatched strength and durability. Low Maintenance. Unlike metal blades that can rust, this one is super easy to care for. It is top rack dishwasher safe for cleaning, and will not get ruined due to moisture. Looking For Something A Little More Swivel-y? For those that prefer swivel style peelers, we also carry a similar tool in that style. It has a removable blade, so it is also adjustable for left or right-handed use. 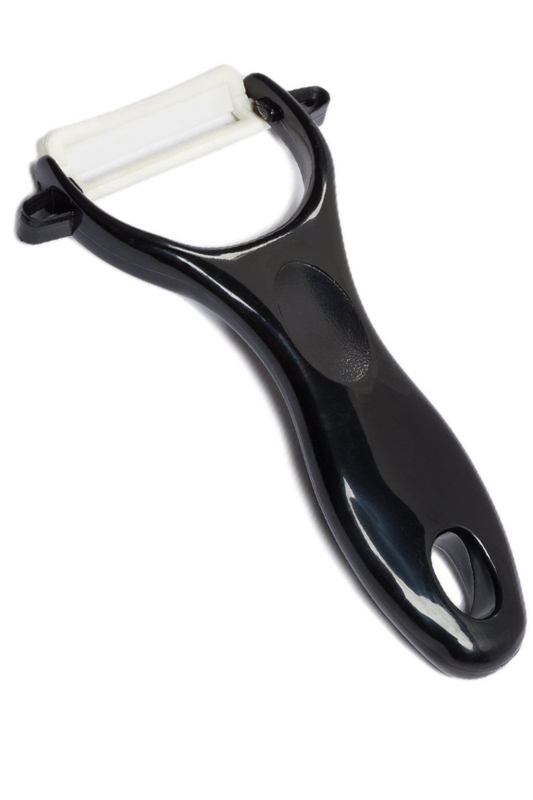 If you prefer a tool that can more easily conform to rounded foods, then be sure to check out the Swivel Blade Ceramic Peeler before you order this one. This amazingly sharp and durable material is not the same stuff your plates are made from. It's a more advanced version known as zirconium oxide. After undergoing a special process, and being pressed under high heat, you end up with a pure white material that is harder than steel, and nearly as hard as diamond. Once created, the ceramic blanks will be sharpened to a razor sharp finish, and then attached to the high quality handle. Because the blade material is so hard, it will last fifteen times longer than similar metal ones without getting dull. The white blade looks pretty cool, but the advantage is much more than stylistic. Metals will alter the smell and flavor of your food in some cases, and when exposed to excess moisture, some can get rusty. This blade is different because it avoids all of that while giving you a longer lasting tool that is also easy to use. It will not react with oils and acids, so your fruits and vegetables will stay pure and unaltered. Instead of browning rapidly when touched by the blade, food will change according to its own natural schedule. The pivoting blade on this tool conforms to different food, and peels with precision. The non stick material allows for effortless peeling, and the added sharpness allows you to glide through soft or hard veggies with ease. Order Yours Today! Easy peeling without turning food brown. The ceramic blade will last 15 times longer than stainless steel. Order Yours Today. The ceramic peeler works just as described. I already had one I use at home, so I bought one for the cabin and also for both my boys and their families. Excellent product! High Quality Tool With Stainless Steel Handle. Easily Open Any Jar! Avoid accidents, increase speed, and improve accuracy. Get professional results without professional ability.